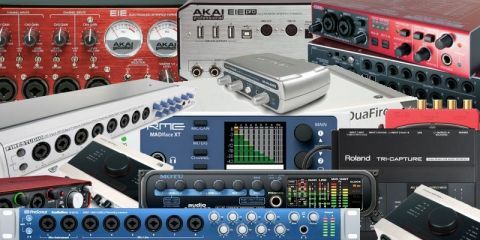 You've come to the right place for audio interface reviews, reports, tips and comparisons, written by experienced electronic musicians to help you find the best audio adapter for your specific purposes whether you are a Musician, Music Producer, Audio Engineer, or DJ. Below is an abbreviated comparison table - to compare additional features such as Bundled Software, DSP Effects, Direct Zero Latency Monitoring, MIDI Ins/Outs, Phantom Power, Routing Software, ADAT, S/PDIF, Word Clock I/O etc. please see our full comparison table. The table above is only a brief comparison - click here for a detailed comparison of features. We are constantly adding more units to this comparison table - if there are any you'd like us to include then please tell us.